tried both 1.03 and 1.04 both are now Broke with Current BIOS's for the X299 series. Same problem. This is the error message. Newest version of both the software and bios on a X299 FTW K.
Not a Number but thank you. 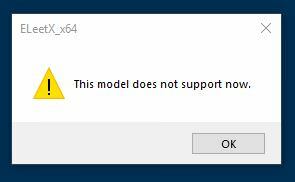 same issue: "This model does not support now." --also attempted installing v1.0.4 -no change. --also attempted uninstalling and reinstalling v1.0.3 -no change. Hi everyone, we're aware of this issue. I believe a new version of E-LEET is planned to be released this week, which should fix the issue. Awesome! thank you for the heads up. I'll try it out when I get home!